Directly across from Maschio Angioino, the gloomy fortress at the port, is the pier for ferries and hydrofoils. 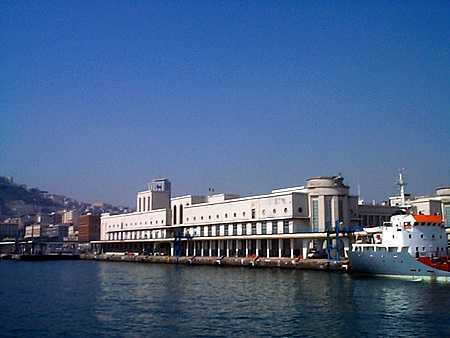 It is named Molo [pier] Beverello and includes the facility adjacent to it on the east, the large passenger terminal built in the 1930s (photo). Molo Beverello and the adjacent facilities handle all of the day traffic to the Sorrentine peninsula, to the islands of Ischia and Capri, and even car and passenger traffic to Sicily and Sardinia. It also handles larger vessels on Mediterranean cruises. Adjacent to Molo Beverello on the west is another pier, Molo S. Vincenzo. It is little used, simply because it is too small. The city has announced that it going to dump 94 million euros into that part of the port. (Who knows? —perhaps even directly into the water, if some critics of the plan are to be believed). Molo S. Vincenzo, for some reasonn I think is what has stopped me from ever getting out onto the main breakwater of the port of Naples. It is very long and terminates in a lighthouse and a charming statue of San Gennaro, the patron saint of Naples. Every time I try to gain access to whatever secret little passageway will get me out on that breakwater, I run afoul of some "no entry" sign around Molo S. Vincenzo. Yet, whenever I sail out through the harbor on the way "to smite the sounding furrows and sail beyond the sunset and the baths of all the western stars", I see people sitting out there, fishing! They didn't row out there, either, because I can see their cars parked nearby. They drove out there on the street (of sorts) that runs the entire length of the breakwater on the sheltered side. Back at Molo Beverello the other day, they found an unexploded WW2 bomb at the bottom of the harbor near the passenger terminal while they were dredging. About five feet long and two in diameter, the bomb was a reminder of the days when the entire port section of the city and other strategic sites such as the train station were the target of Allied air-raids against the Germans, who were occupying Naples. The newspaper article waxed nostalgic about the possibility of still finding some legible graffiti on the bomb casing, such as "Hey, Benito — This one's for you!" Alas, there was no such historic drivel; the bomb was removed by divers of the SDAI (Servizi difesa antimezzi insidiosi) —the bomb squad— and everything returned to normal. There is legitimate concern, however, about the next time. There is almost certain to be a next time, too, since dredging in the harbor will continue for the planned renovation of a large section of the passenger piers. Also, construction of new buildings along the entire port-side road, via Marina, often entails digging way down into terrain perhaps undisturbed since 1943. The entire area was a target, and the chances of coming across even more live ordnance are high. The port of Naples extends to the east for another mile or so. Once past the main passenger terminal adjacent to Molo Beverello, the facilities are almost totally given over to container ships and other freighters. Like any other area that has undergone a century of rebuilding, decay, bombardment, more decay and more rebuilding, the entire area along the main road that runs the length of the port is an unbelievable hodgepodge of architecture. The great boom of construction called the risanamento at the turn of the twentieth century tore down the ancient port facilities in order to build the main road that leads east out of the city. That construction eliminated all but the most obvious signs that there was ever an olden Naples in that area; for example, city builders of 1900 left standing a few remnants of the old Carmine Castle across from Piazza Mercato. Later construction during the 1930s is responsible for a number of large buildings in the port, including the main passenger terminal. The port, especially the eastern end, was then heavily bombed in WW II. Newer office buildings put up over the last 20 years along the long portside road have now repaired much of that damage, if adding to the eye-jolt of large glass and steel buildings right next to what is left of the church of Santa Maria di Portosalvo, built in 1554. The tiny church was once the spiritual home to many Neapolitan sailors. Outside the church is a stone cross, a monument to the retaking of the Kingdom of Naples by the Bourbons in 1799, which episode ended the short-lived Neapolitan Republic. Near the church, but across the main road and within the port itself, at water's edge, is the only other obvious bit of earlier Naples. It is the old quarantine station (photo), the Immacolatella, finished in the 1740s. It was built to the plans of D.A. Vaccaro, the prominent painter, sculptor, and architect whose works are scattered throughout Naples, including the beautiful majolica-tile courtyard of the Church of Santa Chiara. The Immacolatella is so-called from the sculpture of the Immaculate Virgin above the facade. Extensive expansion and modernization of the entire port of Naples will continue throughout 2004.